Daniil Medvedev beat Marton Fucsovics 6-4 6-3, to triumph in the final of the Sofia Open on Sunday. Having lost to Kei Nishikori at the Brisbane International a month ago, Daniil Medvedev was participating in his second ATP Tour final of 2019. Be that as it may, the Russian appreciated a difference in fortunes this time around as he got his fourth professional tennis title in straight sets. Medvedev put Fucsovics under strain at an early stage and had wasted three break points when he made one stick to go 4-3 in front. Medvedev recaptured his lead in the following set and proceeded to secure the opener, despite Fucsovics’ failed attempt at trying to hit back promptly. The following achievement came right off the bat in the second set and Medvedev endure two break points in the 6th game, as Fucsovics’ most obvious opportunity at a fightback slipped from his grip. Medvedev completed the match with a break to love. 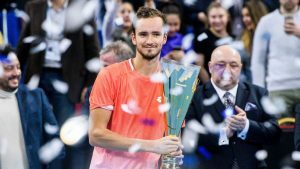 Daniil Medvedev continuing to mop up titles, beats Marton Fucsovics in straight sets to take the Sofia title this week. Already four titles to the name of the Russian at 22y.o, all coming inside the last thirteen months. Winning machine.